If you’ve watched any of the Marvel Cinematic Universe movies, you don’t need any introduction to Black Widow. Played by Scarlett Johansson, the former KGB operative turned Agent of SHIELD is highly-trained, tough-as-nails and one of the few mere mortals capable of standing among Earth’s Mightiest Heroes. She’s trained in multiple martial arts, a master spy and as lethal as her namesake even when she isn’t outfitted with her trademark weapon, the Widow’s Bite. Her current status quo in the comics, however, may require some explanation. Natasha Romanov is dead, killed by an evil version of Steve “Captain America” Rogers, during the Secret Empire incident, where Hydra briefly took over the world by rewriting reality and turning Captain America into one of their most stalwart defenders. Her former masters in The Red Room, however, saw fit to create several clones of their prize pupil and implanted a copy of her memories into one of them. The new Black Widow promptly killed everyone, along with her tube-grown “sisters”, leaving herself as a living ghost. As Black Widow #1 opens, Natasha is back at work alongside Captain America, working to stop a terrorist attack planned on New Years Eve that is using another copy of Captain America as a cover. She finds, however, that her heart is no longer as moved by heroism as it once was and the killer The Red Room created decades ago is demanding satisfaction. This leads to Natasha taking on a new identity and seeking employment that will allow her to do what she does best – kill very bad people. The story by The Twisted Twins (i.e. Jen Soska and Sylvia Soska, who write, produce, direct and star in horror movies when they aren’t making comics) doesn’t pull any punches, as one would expect given their previous works. They write Natasha with all the strength you would expect but aren’t afraid to let our heroine get her hands dirty, tell-off Captain America and do a dozen other things that even Black Widow would only attempt with the freedom that comes from being “truly dead.” The idea that Natasha is regressing from the person she became because she no longer feels anything except a desire to kill is a fascinating conceit and it will be interesting to see how this is developed in later issues. Unfortunately, the artwork doesn’t show as much promise as the story. Flaviano is generally competent, and the action sequences of the book are well-choreographed. The story flows easily enough from panel to panel, but the inks and shading are erratic throughout. There’s also some minor inconsistencies in the character designs across panels, with the sizes of noses being constantly changed and the shapes looking downright odd in some panels. The color art by Veronica Gandini is skillfully done, however, with a wonderful variety of palettes used for different locations and times of day. The word balloon placement and lettering effects by Joe Caramagna are also well done. If you liked Black Widow in the movies, you’ll love this new series. It’s easily accessible to new readers but long-time fans of Agent Romanov, good espionage stories or The Soska Sisters’ previous works will find it worth their time to check out this mini-series as well. 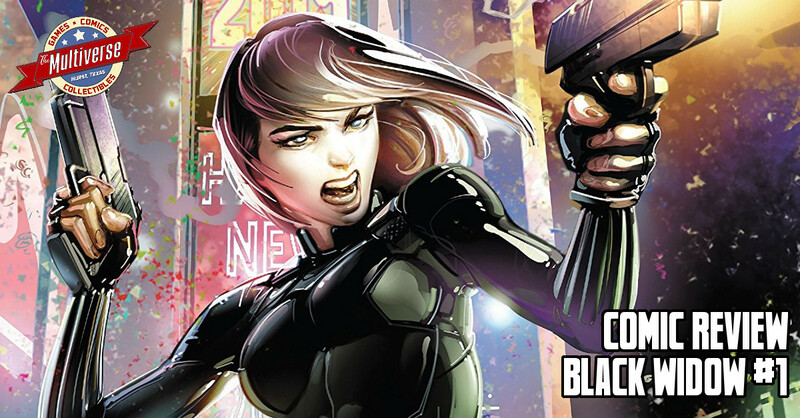 Black Widow #1 releases on January 16, 2019!